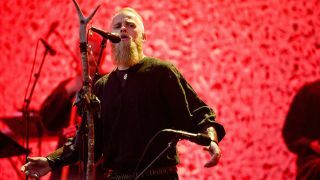 Skuggsjá, the thrilling and tempestuous collaboration between Wardruna and Enslaved, is coming to London next March as part of a unique three-day series of events called London By Norse, partnered by Metal Hammer and in association with Old Empire and Tidal Concerts. London By Norse is the brainchild of By Norse, a celebration of Norwegian music and culture founded by Simon Füllemann (All Access Agency), Einar Selvik (Fimbuljod Productions, Wardruna) and Ivar Bjørnson (Peerson Productions, Enslaved). Taking place on March 17-20 across various venues in the capital the centrepiece at the Shepherd’s Bush Empire on March 19 will be the third ever performance of Skuggsjá – a suite of songs composed by Wardruna’s Einar Selvik and Enslaved’s Ivar Bjørnson, that will coincide with an album release via Season Of Mist Records. Commissioned to commemorate – and castigate – the 200th anniversary of Norway’s constitution, which took place last year, Skuggsjá is a furious journey into the dark reaches of Norwegian history. A counterweight to the enshrining of Christianity as the national religion and a harsh light on the atrocities committed in its name, its white-knuckle journey through innumerable musical moods is also a reminder of the rich pagan culture that was lost as a result. Featuring all members of both bands, it will also be accompanied by the striking visuals of Costin Chioreanu, whose collaborations with the likes of At The Gates, Mayhem, Darkthrone, Arcturus, Roadburn festival and many more has made him one of the most renowned artists in the metal world today. Another major event of London By Norse is ‛Enslaved 25’, three special shows by the Bergen five-piece to commemorate a quarter-century’s worth of cultural and spiritual invocations and ever-expanding musical horizons. The first show of ‘Enslaved 25’ will be at The Dome on March 17, with support acts to be announced, and their journey will continue the following night at the Underworld, before culminating the night after that at the Shepherd’s Bush Empire. As well as the Skuggsjá performance, that night will also feature Wardruna’s second ever appearance in the UK and a rare art exhibition by former Gorgoroth and God Seed vocalist Gaahl. On March 18, The Forge in Camden will see Enslaved’s Ivar presenting his immersive electro-ambient project Bardspec, while Einar Selvik will be presenting his workshop, a spellbinding solo performance and wide-ranging talk that takes in the philosophy of Wardruna, the background to the ancient instruments he uses, and on the historical background to Skuggsjá. More events are planned for March 20, so watch this space for further announcements! London By Norse is more than just a cultural event: it’s a reconnection to an abiding spiritual wellspring often obscured by the density of modern life and a celebration of values that have always lain at the deepest heart of heavy metal. A season pass for all four days will be a very reasonable £60, including a special laminated tour pass and 30 days free of TeamRock+ membership, which will give you access to full Metal Hammer magazine content online (TeamRock will contact you within two weeks from your date of purchase with information on how to activate your membership). These various packaged deals and day passes are also available. Check out www.bynorse.com for more details and to buy tickets for this unmissable event!